There’s a very pretty and useful systems thinking resource now available and I haven’t made any noise about it. The new resource is a teacher’s guide designed to accompany my Connected Wisdom book. Co-written with Carolyn Finely at SEED/Schlumberger, the 12 chapters are packed with activities designed for ages 10-18. It’s useful though to anyone interested in learning more about living systems principles. The book’s drop-dead beautiful aesthetics are thanks to book’s art director, Milton Glaser and Guy Billout, the illustrator. 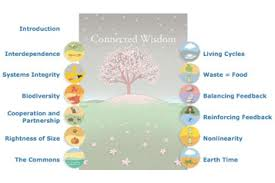 There’s also a Connected Wisdom on-line training module (also free) designed for educators and facilitators. Enjoy and spread the word please.